Sjogren’s syndrome with keratoconjunctivitis sicca may be seen. CREST SYNDROME consists of calcinosis (C), Raynaud’s phenomenon (R), oesophageal involvement (E), sclerodactyly (S) and telangiectasia (T). Antinuclear antibodies to the centromere are found in the blood. SERUM ANTINUCLEAR ANTIBODIES are often positive. Antinucleolar and anticentromere antibodies are specifically elevated. A positive rheumatoid factor is found in 30% of cases. A NORMOCHROMIC NORMOCYTIC ANAEMIA can be seen. An acquired haemolytic anaemia with ‘cold’ agglutinins may occur. The ESR may be raised. X-RAYS OF THE HANDS may show deposits of calcium around the fingers. In severe cases there is erosion and resorption of the tufts of the distal phalanges. BARIUM SWALLOW to detect oesophageal involvement is often a useful confirmatory test. No treatment has been shown to influence the progress of this condition. Management is therefore symptomatic. In some patients the disease is mild, whilst in others it is severe and complicated by systemic features such as renal disease. The mean 5-year survival rate is 50%. Polymyositis is a disorder of muscle in which the pathological features are necrosis of muscle fibres together with evidence of regeneration and inflammation, particularly around blood vessels. It presents with proximal muscular wealcness and wasting. When this is accompanied by a rash, it is called dermatomyositis. 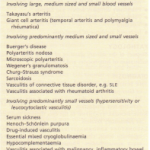 Its incidence is comparable with that of systemic sclerosis, i.e, it is less common than SLE. It occurs at any age, even in children, but with a peak incidence in adults aged between 30 and 60 years. It is twice as common in women as in men. The aetiology is, unknown, but immunological and viral factors have been suggested. Dermatomyositis is associated with an increased incidence of carcinoma of the bronchus in men or of the ovary in women, mainly in patients presenting after 50 years of age. 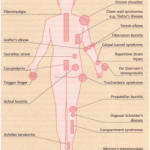 ARTHRALGIA OR ARTHRITIS occur in about half of all patients and may be the presenting feature, occurring before the onset of the muscular symptoms. The small joints of the hands are particularly affected but the arthritis may extend in a distribution resembling that of RA. 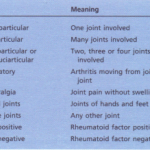 Joints are often swollen but the arthritis is intermittent and not progressive. DYSPHAGIA is found in 50% of cases and is due to oesophageal muscle involvement. SJOGREN’S SYNDROME AND RESPIRATORY PROBLEMS may occur. 1 Muscle enzymes. Serum creatine phosphokinase and aldolase are raised and can be used to follow the progress of the disease during treatment. 2 EMG. Short polyphasic motor potentials, sometimes spontaneous fibrillation and high-frequency repetitive discharges (see p.951) are almost pathognomonic of polymyositis. 3 Muscle biopsy. This shows necrosis of muscle fibres with swelling and disruption of muscle cells. Vacuolation, fragmentation and fibrosis of the fibres are seen, with thickening of the blood vessels. There are also inflammatory changes. THE ESR IS USUALLY RAISED. A normochromic normocytic anaemia and a polymorphonuclear leucocytosis are seen in acute cases. SERUM ANTINUCLEAR ANTIBODIES AND TESTS FOR RHEUMATOID FACTOR may be positive. 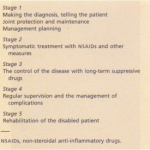 Systemic corticosteroids, starting with 60 mg of prednisolone daily and reducing to a maintenance dose of about 15 mg daily are used. In most cases this produces a gradual remission of the disease. Physiotherapy may be required to restore muscle power. Treatment is required for a variable period, usually months but sometimes years. Some patients fail to respond to steroids, and immunosuppressive drugs such as methotrexate or aiathioprine may be required. Fifty per cent of affected children die within 2 years. In adults the prognosis is better, except in association with malignancy. The existence of this rare disorder emphasizes the overlap between the connective tissue diseases, although it may not itself be a distinct entity. It is a useful term for cases with features of more than one of the connective tissue diseases together with high titres of antibody to an extractable nuclear antigen such as RNP. Like the other conditions, it affects women more often than men and presents in young adults. phenomenon, proximal muscle weakness and wasting, and a puffy swelling of the skin of the hands that somewhat resembles the changes occurring in scleroderma. Other features of SLE, polymyositis or scleroderma may appear, but serious problems such as renal disease are unusual. The condition tends to be benign and often responds well to small doses of prednisolone. Biopsies of the salivary gland or of the lip show a focal infiltration of lymphocytes and plasma cells. LABORATORY ABNORMALITIES include raised immunoglobulin levels, circulating immune complexes and many autoantibodies. Rheumatoid factor is usually positive, antinuclear antibodies are found in 60-70% and antimitochondrial antibodies in 10% of cases. Anti-Ro (SSA) antibodies are found in 70% of cases compared with 10% of cases of RA and secondary Sjogren’s syndrome. This antibody is of particular interest because it can cross the placenta and cause congenital heart block.